NATIONWIDE: The first three days of Songkran's “seven dangerous days’’ saw 188 deaths and 1,934 people hospitalised in 1,846 road accidents across the country. Yesterday (Apr 13) alone, Songkran Day, there were 820 road accidents, claiming 86 lives and hospitalising 852 people, Maj Gen Ekkarak Limsangkat, commander of Special Branch Police 3, said today (Apr 14). This brought the accumulated death toll from April 11 to 13 to 188 in 1,846 accidents, which also injured 1,934 people. Drink-driving remained the major cause of the crashes (47.6%), followed by speeding (27.4%). Most of the accidents (78.9%), involved motorcycles, said Maj Gen Ekkarak. Provincial authorities have instructed police and officials manning checkpoints to strictly enforce traffic laws, particularly in at-risk districts. At 2,029 checkpoints nationwide, 172,294 people faced legal action for traffic law violations. Of the total, 50,197 failed to wear crash helmets and 45,485 drove without licences, said the Special Branch Police 3 commander. Chiang Mai saw the highest numbers of road accidents (65) and injuries (70). Nakhon Ratchasima, Buriram and Phetchabun, saw the highest death toll (eight each). Eleven provinces reported no deaths, said Maj Gen Ekkarak. 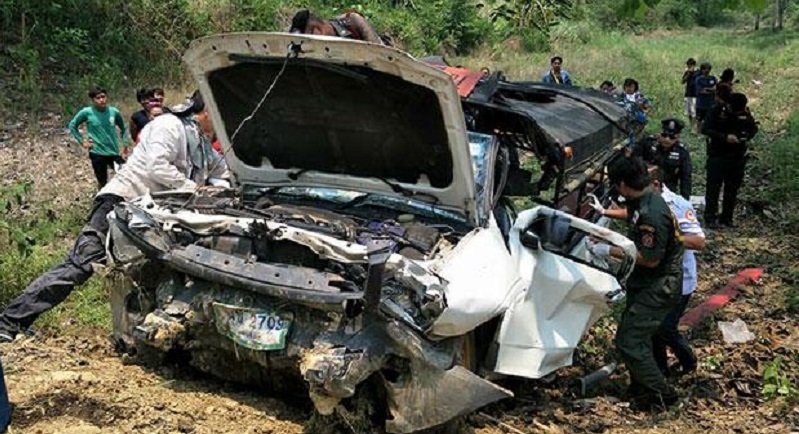 Department of Disaster Prevention and Mitigation chief Chayapol Thitisak, in his capacity as secretary to the Road Safety Centre, said 57.4% of the people killed in Songkran road accidents over the past three days were local people living in the areas where the crashes occurred. Most of the dead victims (80.8%) were drivers. The centre has instructed provincial authorities to strictly check motorcycle drivers and car drivers whose behaviours, including drink-driving and speeding, were at risk. Meanwhile, a total of 113,960 people were found to have violated the anti-drink-driving measures over the past three days, with 2,991 vehicles impounded, National Council for Peace and Order and army spokeswoman Sirichan Ngathong said today. The impounded vehicles were being properly cared for. Owners could contact officials to get their vehicles after the Songkran holiday, said Col Sirichan. Nothing will improve, year after year. Doesn't matter how many tents with relaxing tv watching, drinking officials you put at road sides. Sometimes it feels they feel ok with it. Just 'cosmetic cover ups'. Real change has to come from teaching kids in kinder garden  about 'better safe than sorry'. 'Older' proves yearly not getting touched by safety thinking. Of course its acceptable. No one cares. With a population of some 65 million Thailand can afford to lose a few and let the families look after the infirm cos there aint no welfare system. I cannot believe that anyone can think that this is acceptable for just three days of Songkran ,this is an absolute disgrace .